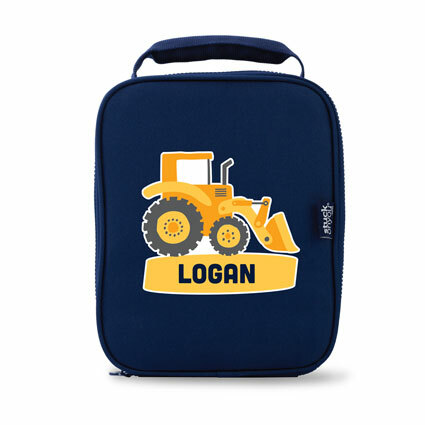 Our Bento Boxes are leak-proof*, dishwasher safe, BPA/phthalates free and professionally custom-printed with a design of your choice. Jump on the Bento bandwagon and see what all the fuss is about! Just want to throw in a sandwich? You can swap out the normal Bento tray for a 4-compartment sandwich tray to expand your lunch options. *Watch this short YouTube video for tips on how to pull apart your Bento carefully and safely. *Please note that the Bento Box is designed to hold thicker liquids such as yoghurts, sauces and dips. However, it is not watertight so it may not prevent the leakage of runnier liquids such as drinks or any excess oils/juices that leak out from food items like sundried tomatoes and fruits. **Watch this short YouTube video for tips on how to pull apart your Bento carefully and safely..
There’s the Bento Cooler Bag, which keeps the contents of your Box cool and fresh. 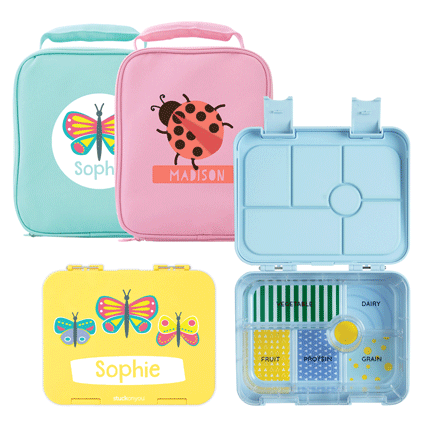 We also have adorable Lunchbox notes and the Bento Box Planner, so you can plan your mealtime fun in advance. WANT TO KNOW MORE ABOUT OUR BENTO BOXES? Click here for Bento Box FAQs! Click here for Bento Box FAQs!